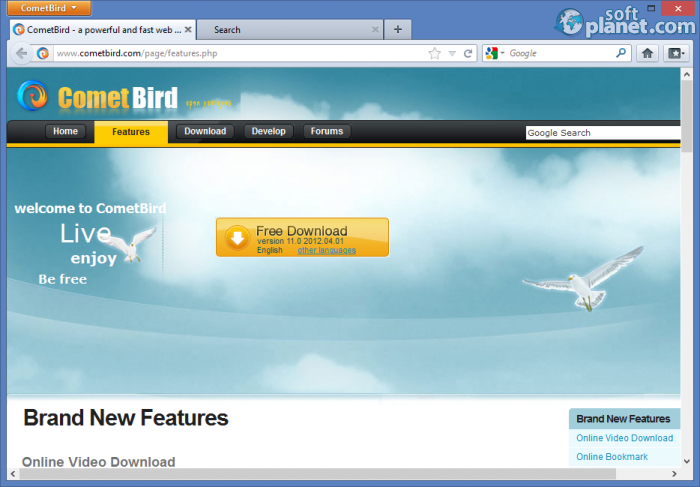 SoftPlanet makes it possible for everyone to get free CometBird download directly from our servers. There is no registration needed for downloading. Probably all of you have heard of Internet Explorer, Google Chrome, Mozilla Firefox, Opera and Safari. These web browsers are the most popular ones. However I am about to present another software to you, which is capable of demonstrating a high performance level. It is called CometBird 11.0. It is a fast, powerful and stable web browser, which can easily replace your current one. 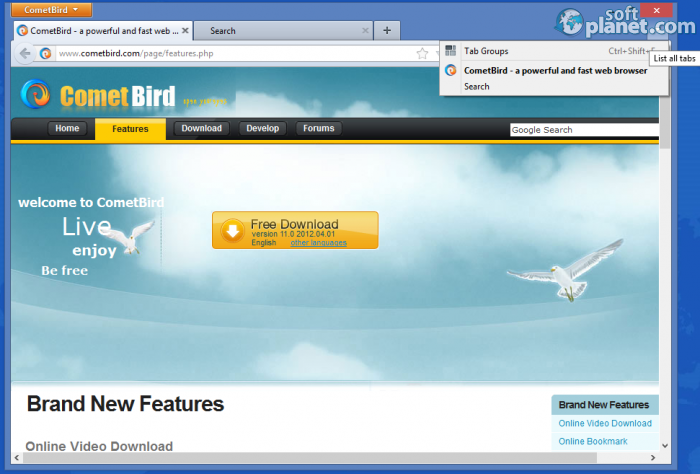 CometBird 11.0 is a secure, quick and absolutely free web browsing software solution. Above all common features, it comes with some entirely new ones, which could change the way you use the web. For instance, you can download online videos from any video site. 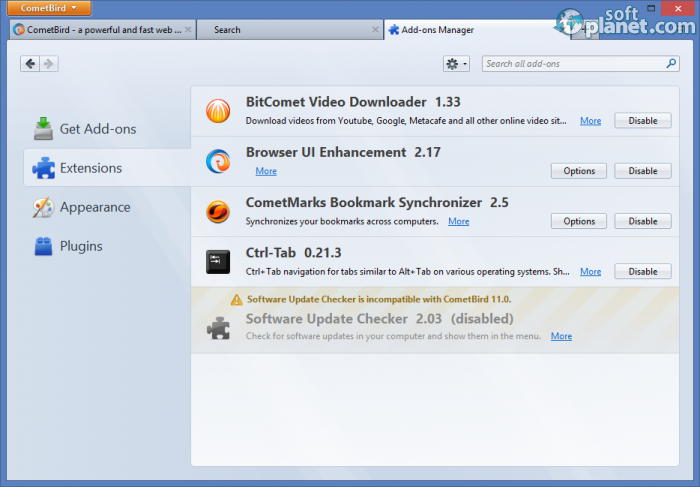 Thanks to the CometMarks features, you are able to synchronize your bookmarks among different browsers and PCs. That's not all, you can even manage them anytime and anywhere. CometBird 11.0 comes with great tab management as well. You are able to switch among tabs easily just by a single key combo – CTRL + TAB. CometBird 11.0 is developed from the source code of Mozilla Firefox and also follows the source code license of Mozilla. Thus it won't surprise anybody that there are a thousand similarities between these two web browsers. 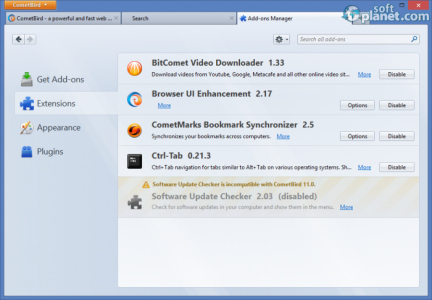 Thanks to the carefully selected add-ons, the developers have managed to make CometBird 11.0 stable and user-friendly. I really like the Tab Groups view mode, which allows you to have an overview of all your currently loaded pages and even group them. Let's say that you have more that 20 opened tabs. It is really hard to find the one you need. Thus the developers have implemented a search within the Tab Group interface. It is really convenient and easy way to get what you want. Thanks to its great brand new features and very intuitive and user-friendly interface, it is very easy to work with CometBird 11.0. I was really impressed by its performance level, which is better than what its rival achieves in some cases. I didn't notice a single bug during the tests. Unlike some web browsers, it didn't crash once as well, which is pretty impressive for such a project. If you are sick and tired of all the famous web browsing solutions available today, you can try a new one now. 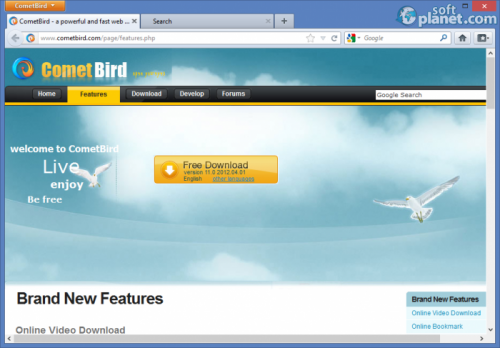 It is called CometBird 11.0 and comes with some fresh features, which can really improve your web browsing experience. Please don't hesitate and grab it. 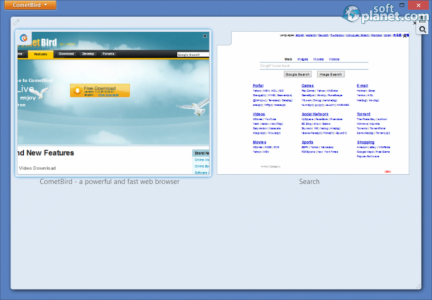 It is a free, fast, reliable and top performance web browser. Our security scan shows that CometBird is clean from viruses. The current version of CometBird has been scanned by our system, which contains 46 different anti-virus algorithms. That ensures that CometBird 11.0 is 100% safe for your computer.